Little Dexter, the Belted Galloway is new on the scene and already making a big name for himself. This fluffy Beltie calf stood in in front of his mum's signature white belt is Dexter. A little lad with a lot of character! I always say that each cow has their own individual personality and this little guy has one big attitude, that always makes me laugh! 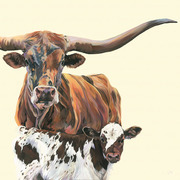 The painting, being larger than the print, radiates character. The texture and colour in his curly hair makes you want to reach into the painting bury his fingers in his fur and scruff up his coat. 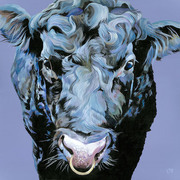 As all Lauren's Cows paintings, it's full of subtle accents of colour that makes it highly adaptable to any decor. Wether your home is a country farmhouse, victorian townhouse or modern flat Dexter will fit right in and soon be part of the family. Framed in shabby chic white box frame.